You are here: Home / online shopping / Bath & Body Works Cyber Monday Deals! Bath & Body Works has some AWESOME Cyber Monday deals and the best part is that you can score 25% off your entire purchase! 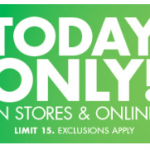 Until 4 pm EST only, get select full size Signature Care items for just $5 each! That makes them just $3.75 after the discount code! Keep in mind that this offer is available exclusively online. This deal is ALWAYS a favorite with me! Buy 3 Signature Collection items, get 3 free! The items are priced at $12.50 each, so you can get 6 for $37.50! These make great teacher, neighbor, and friend gifts. This is also a great time to just stock up for yourself! You must add multiples of six to get this deal! 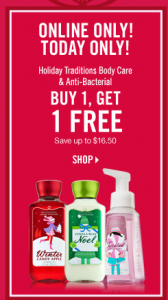 Today only, get Holiday Traditions Body Care and Anti-Bacterial products BOGO free! Get 2 items for $12.37 with the discount! Shipping was $5.95 for me! There are so many other AWESOME deals available on their site! I love Bath & Body Works products and took advantage of this sale! 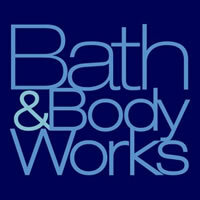 Bath & Body Works: Buy 3 of ANYTHING, get 3 FREE in stores only! 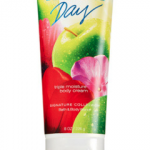 Bath & Body Works: 11 products for $26.80 shipped plus cash back!